For other variants of this aircraft, see Boeing 737, Boeing 737 Classic, and Boeing 737 MAX. The Boeing 737 Next Generation, commonly abbreviated as 737NG, or 737 Next Gen, is the −600/-700/-800/-900 series of the Boeing 737 airliner. It is the third generation derivative of the 737, and follows the 737 Classic (−300/-400/-500) series, which began production in the 1980s. They are short- to medium-range, narrow-body jet airliners powered by two engines. Produced since 1996 by Boeing Commercial Airplanes, the 737NG series includes four variants and can seat between 110 and 210 passengers. Formally launched in 1993, the 737NG is an upgrade of the preceding 737 Classic models featuring a redesigned wing that is larger in area, with a wider wingspan, and greater fuel capacity. 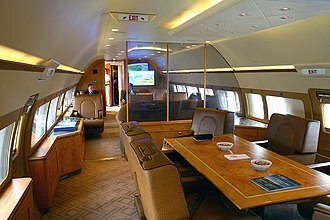 It is equipped with CFM56-7 series engines, a glass cockpit, and features upgraded and redesigned interior configurations. Performance and capability upgrades over its predecessor include longer range, greater capacity (in its largest variants), and available higher maximum takeoff weight (MTOW) specifications. As of 31 January 2019, a total of 7,089 737NG aircraft have been ordered, of which 6,996 have been delivered. The remaining orders are in the -700 BBJ, -800, -800 BBJ and -900ER variants. The most common variant is the -800, which has had over 5,000 delivered as of 2019 and is the most widely used narrowbody aircraft worldwide. The 737NG's primary competition is with the Airbus A320 family. Upgraded and re-engined models in development as the 737 MAX series is to supplant the 737NG, with the first 737 MAX delivered in 2017. 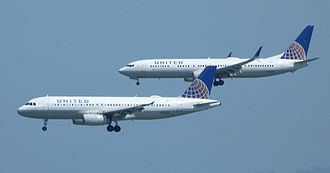 When regular Boeing customer United Airlines bought the more technologically advanced fly-by-wire Airbus A320, this prompted Boeing to update the slower, shorter-range 737 Classic variants into the more efficient, longer New Generation variants. In 1991, Boeing initiated development of an updated series of aircraft. After working with potential customers, the 737 Next Generation (NG) program was announced on November 17, 1993. The 737NG encompasses the -600, -700, -800 and -900 variants. The NG program was the most significant upgrade of the airframe to date. The performance of the 737NG would be essentially that of a new airplane, but important commonality would be retained from previous 737 generations. The wing was modified to increase its area by 25 percent and its span by 16 ft (4.88 m). Though a thinner cross-section was created, the total fuel capacity was increased by 30 percent. New quieter and more fuel-efficient CFM56-7B engines were used. These improvements combined to increase the 737's range by 900 nmi, permitting transcontinental service. A flight test program was performed using 10 of the new NG aircraft: 3 -600s, 4 -700s, and 3 -800s. The passenger cabin of a 737 Next Generation aircraft improved on the previous interior of the Boeing 757-200 and the Boeing 737 Classic variants by incorporating select features from the Boeing 777 such as larger, more rounded overhead bins and curved ceiling panels. The interior of the 737 Next Generation also became the standard interior on the Boeing 757-300 and subsequently became optional on the 757-200. 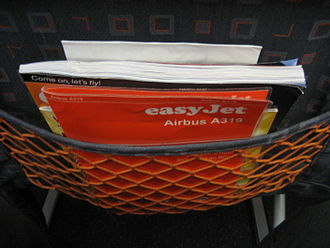 In 2010, the interiors of new 737 Next Generation aircraft would include an updated interior design similar to that of the Boeing 787. Known as the Boeing Sky Interior (BSI), it introduced new pivoting overhead bins (a first for a Boeing narrow-body aircraft), new sidewalls, new passenger service units, and LED mood lighting. Boeing's newer "Space Bins" can carry 50 percent more than the pivoting bins, thus allowing a 737-800 to hold 174 carry-on bags. Boeing also offered BSI retrofits for older 737NG aircraft. The monthly production rate could reach 57 per month in 2019, even to the factory limit of 63 later. A single airplane is produced in Boeing Renton Factory in 10 days, less than half what it was only a few years ago. The empty fuselage from Spirit AeroSystems in Wichita, Kansas, enters the plant on Day 1. Electrical wiring is installed on Day 2 and hydraulic machinery on Day 3. On Day 4 the fuselage is crane-lifted and rotated 90 degrees, wings are mated to the airplane in a six-hour process, along with landing gear, and the airplane is again rotated 90 degrees. The final assembly process begins on Day 6 with the installation of airline seats, galleys, lavatories, overhead bins, etc. Engines are attached on Day 8. It rolls out of the factory for test flights on Day 10. In July 2008, Boeing offered Messier-Bugatti-Dowty's new carbon brakes for the Next-Gen 737s, which are intended to replace steel brakes and will reduce the weight of the brake package by 550–700 pounds (250–320 kg) depending on whether standard or high-capacity steel brakes were fitted. A weight reduction of 700 pounds (320 kg) on a 737-800 results in 0.5% reduction in fuel burn. Delta Air Lines received the first Next-Gen 737 model with this brake package, a 737-700, at the end of July 2008. On July 20, 2011, Boeing announced plans for a new 737 version to be powered by the CFM International LEAP-X engine, with American Airlines intending to order 100 of these aircraft. Internally, a minimum change version of the Leap-X is the probable final configuration for the proposed re-engined 737, and is expected to give a 10–12% improvement in fuel burn. Entry into service was planned for 2016 or 2017, with the new models probably being designated 737-7/-8/-9, being based on the 737-700/-800/-900ER respectively. On August 30, 2011, Boeing confirmed the launch of the 737 new engine variant, called the 737 MAX. Its new CFM International LEAP-1B engines are expected to provide a 16% lower fuel burn than the current Airbus A320. Boeing delivered the first 737 MAX 8 to Malindo Air on May 16, 2017. The 737 MAX competes with the Airbus A320neo family. The 737-600 was launched by SAS in March 1995 with the first aircraft delivered in September 1998. A total of 69 have been produced, the last aircraft was delivered to WestJet in 2006. Boeing displayed the 737-600 in its price list until August 2012. The 737-600 replaces the 737-500 and is similar to the Airbus A318. Winglets were not an option. WestJet was to launch the -600 winglets, but dropped them in 2006. In November 1993, Southwest Airlines launched the Next-Generation program with an order for 63 737-700s and took delivery of the first one in December 1997. It replaced the 737-300, typically seating 126 passengers in two classes to 149 in all-economy configuration, similarly to the Airbus A319. As of July 2018, all -700 series on order, 1,128 -700, 120 -700 BBJ, 20 -700C, and 14 -700W aircraft have been delivered. By June 2018, around one thousand were in service: half of them with Southwest Airlines, followed by Westjet with 56 and United Airlines with 39. The value of a new -700 stayed around $35 million from 2008 to 2018, a 2003 aircraft was valued for $15.5 million in 2016 and $12 million in 2018 and will be scrapped for $6 million by 2023. Boeing launched the 737-700ER (Extended Range) on January 31, 2006, with All Nippon Airways as the launch customer. Inspired by the Boeing Business Jet, it features the fuselage of the 737-700 and the wings and landing gear of the 737-800. When outfitted with nine auxiliary fuel tanks, it can hold 10,707 gallons (40,530 L) of fuel, and with a 171,000 lb (77,565 kg) MTOW it has a 5,775 nmi (10,695 km) range with 48 premium seats in one class. The first was delivered on February 16, 2007, to ANA with 24 business class and 24 premium economy seats only. A 737-700 can typically accommodate 126 passengers in two classes. It is similar to the Airbus A319LR. The Boeing 737-800 is a stretched version of the 737-700. It replaced the 737-400. 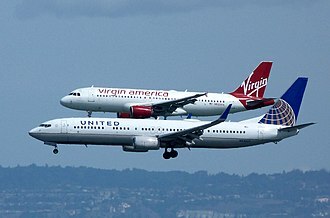 The Boeing 737-800 competes with the Airbus A320. 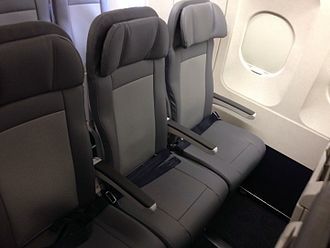 The 737-800 seats 162 passengers in a two-class layout or 189 passengers in a one-class layout. The 737−800 was launched by Hapag-Lloyd Flug (now TUIfly) in 1994 and entered service in 1998. Following Boeing's merger with McDonnell Douglas, the 737-800 also filled the gap left by Boeing's decision to discontinue the McDonnell Douglas MD-80 and MD-90 aircraft. For many airlines in the U.S., the 737-800 replaced aging Boeing 727-200 trijets. The 737-800 burns 850 US gallons (3,200 L) of jet fuel per hour—about 80 percent of the fuel used by an MD-80 on a comparable flight, while carrying more passengers. According to the Airline Monitor, an industry publication, a 737-800 burns 4.88 US gallons (18.5 L) of fuel per seat per hour. In 2011, United Airlines— flying a Boeing 737-800 from Houston to Chicago—operated the first U.S. commercial flight powered by a blend of algae-derived biofuel and traditional jet fuel to reduce its carbon footprint. In early 2017, a new 737-800 was valued at $48.3 million, falling to below $47 million by mid-2018. By 2025, a 17-year-old 737-800W will be worth $9.5 million and leased for $140,000 per month. As of January 2019, Boeing had delivered 4,965 737-800s, 110 737-800As, and 21 737-800 BBJ2s and has 75 737-800 unfilled orders. The 737-800 is the most popular variant of the 737NG and ranks as the most common narrow-body aircraft in service. Ryanair, an Irish low-cost airline, is among the largest operators of the Boeing 737-800, with a fleet of over 400 737-800 aircraft serving routes across Europe, Israel and North Africa. In February 2016, Boeing launched a passenger-to-freighter conversion program, with converted aircraft designated as 737-800BCF (for Boeing Converted Freighter). Boeing started the program with orders for 55 conversions, with the first converted aircraft due for late 2017 delivery. The first converted aircraft was delivered to West Atlantic in April 2018. At the 2018 Farnborough Airshow, GECAS announced an agreement for 20 firm orders and 15 option orders for the 737-800BCF, raising the commitment to 50 aircraft. Total orders and commitments include 80 aircraft to over half a dozen customers. Modifications to the 737-800 airframe include installing a large cargo door, a cargo handling system, and additional accommodations for non-flying crew or passengers. The aircraft is designed to fly up to 1,995 nmi (3,695 km) at a MTOW of 79 tonnes. Boeing later introduced the 737-900, the longest variant to date. Because the −900 retains the same exit configuration of the −800, seating capacity is limited to 189 in a high-density 1-class layout, although the 2-class number is lower at approximately 177. Alaska Airlines launched the 737-900 in 1997 and accepted delivery on May 15, 2001. 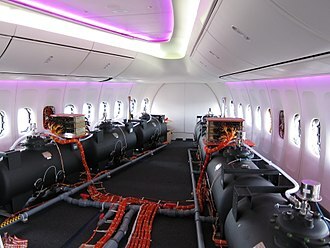 The 737-900 also retains the MTOW and fuel capacity of the −800, trading range for payload. These shortcomings until recently prevented the 737-900 from effectively competing with the Airbus A321. The 737-900ER (ER for extended range), which was called the 737-900X prior to launch, is the newest addition and the largest variant of the Boeing 737 NG line and was introduced to meet the range and passenger capacity of the discontinued 757-200 and to directly compete with the Airbus A321. An additional pair of exit doors and a flat rear pressure bulkhead increased seating capacity to 180 passengers in a two-class configuration. It can accommodate up to 220 passengers. Some airlines seal the additional exit. Additional fuel capacity and standard winglets improved range to that of other 737NG variants. The first 737-900ER was rolled out of the Renton, Washington factory on August 8, 2006 for its launch customer, Lion Air, an Indonesian low-cost airline. The airline received this aircraft on April 27, 2007 in a special dual paint scheme combining the Lion Air's logo on the vertical stabilizer and the Boeing's livery colors on the fuselage. Lion Air has orders for 103 Boeing 737-900ERs as of September 2017. As of January 2019, 52 -900s, 490 -900ERs, and seven -900 BBJ3s have been delivered with 15 unfilled orders. With a smaller operator base, the -900ER is not as liquid as other variants: in October 2018, a ten-year-old -900ER was worth $19.4 million and leased for $180,000 per month over eight years, below the -800, while there is a premium for the A321 over the A320. By 2025, a seventeen-year-old -900ER will reach $8.5 million with a $120,000 lease, $1 million and $20,000 less per month than a -800W of the same age, and could be parted out or converted to a freighter. Boeing 737 AEW&C: The Boeing 737 AEW&C is a 737-700IGW roughly similar to the 737-700ER. 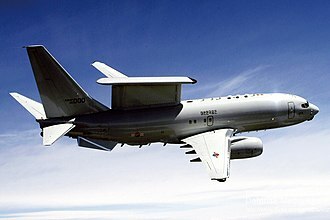 This is an Airborne Early Warning and Control (AEW&C) version of the 737NG. Australia is the first customer (as Project Wedgetail), followed by Turkey and South Korea. C-40 Clipper: The C-40A Clipper is a 737-700C used by the U.S. Navy as a replacement for the C-9B Skytrain II. The C-40B and C-40C are used by the US Air Force for transport of generals and other senior leaders. 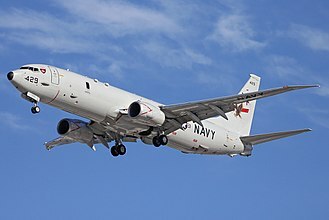 P-8 Poseidon: The P-8 is a 737-800ERX ("Extended Range") that was selected on June 14, 2004 to replace the Lockheed P-3 Orion maritime patrol aircraft. The P-8 is unique in that it has 767-400ER-style raked wingtips, instead of the blended winglets available on 737NG variants. 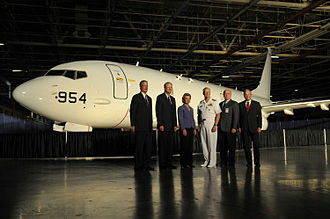 The P-8 is designated 737-800A by Boeing. 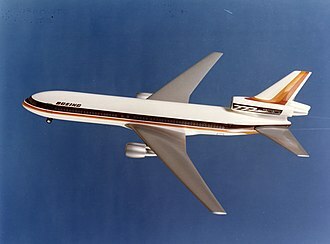 In the late 1980s, Boeing marketed the Boeing 77-33 jet, a business jet version of the 737-300. The name was short-lived. After the introduction of the next generation series, Boeing introduced the Boeing Business Jet (BBJ) series. The BBJ1 was similar in dimensions to the 737-700 but had additional features, including stronger wings and landing gear from the 737-800, and has increased range (through the use of extra fuel tanks) over the other various 737 models. The first BBJ rolled out on August 11, 1998 and flew for the first time on September 4. As of July 2018, 6,343 Boeing 737 Next Generation aircraft were in commercial service. This comprised 39 -600s, 1,027 -700s, 4,764 -800s and 513 -900s. According to the Aviation Safety Network, the Boeing 737 Next Generation series has been involved in 15 hull-loss accidents and 10 hijackings, for a total of 590 fatalities. The worst one involving the aircraft was Air India Express Flight 812 which crashed in 2010. 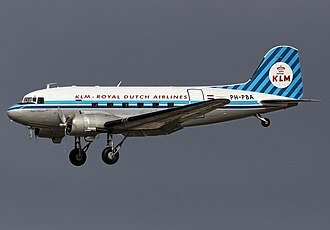 An analysis by Boeing on commercial jet airplane accidents in the period 1959–2013 showed that the Next Generation series had a hull loss rate of 0.27 per million departures versus 0.54 for the classic series and 1.75 for the original series. 123 @32" - 130 @ 30" 140 @32" - 148 @ 30" 175 @32" - 184 @ 30" 177 @32" - 215 @ 28"
^ a b "First Boeing 737-700 Goes to Southwest Airlines" (Press release). Boeing. 1997-12-17. ^ a b c d e f g h i "737 Model Orders and Deliveries data". Boeing, March 2019. Retrieved April 9, 2019. ^ "737NG: The Next Generation for Japan and the world". Boeingblogs.com. 2005-02-04. Retrieved 2013-07-26. ^ a b Derber, Alex (2018-06-14). "Inside MRO: Boeing 737-800 Not Expected To Peak Until 2021". Aviation Week & Space Technology. ^ "Leahy reflects on 33 years at Airbus". Leeham. Nov 28, 2017. ^ Endres 2001, p. 132. ^ Endres 2001, p. 133. 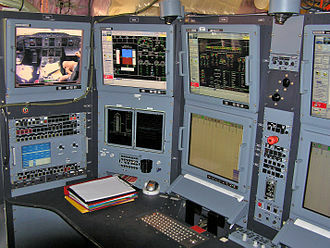 ^ "Boeing Sky Interior offered for 737NG retrofits - Runway Girl". December 30, 2013. ^ Shaw 1999, pp. 14–15. ^ "Boeing ups 737 production rate". Flightglobal.com, September 17, 2010. ^ "Boeing to Increase 737 Production Rate to 52 per Month in 2018". Boeing, October 2, 2014. Retrieved November 10, 2014. ^ "737 derailment probe 'suggests' track alignment issue". Flightglobal.com, November 5, 2014. ^ "1th 737 MAX on the assembly line as Boeing gears up for delivery next year". Leeham News. October 11, 2016. ^ Wilhelm, Steve. "Mindful of rivals, Boeing keeps tinkering with its 737". Puget Sound Business Journal, August 11, 2008. Retrieved September 11, 2013. ^ "Boeing Next-Generation 737 Carbon Brakes Earn FAA Certification". Boeing Press Release, August 4, 2008. Retrieved August 30, 2009. 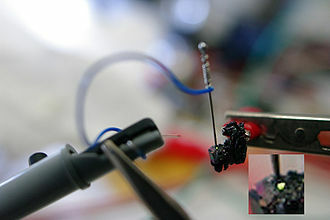 ^ "Report alleges faulty parts in jets". United Press International, August 21, 2006. Retrieved August 22, 2006. ^ "Boeing Safety Claims Investigated". Al Jazeera English via youtube.com, December 15, 2010. ^ "Boeing firms up 737 replacement studies by appointing team". Flight International, March 3, 2006. Retrieved April 13, 2008. ^ Hamilton, Scott. 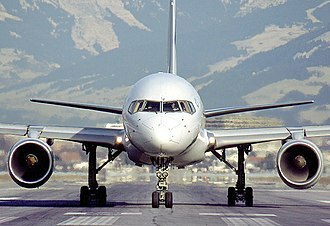 "737 decision may slip to 2011: Credit Suisse". flightglobal, 2010. Retrieved June 26, 2010. 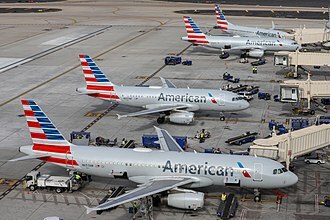 ^ "Boeing and American Airlines Agree on Order for up to 300 Airplanes". Boeing, July 20, 2011. Retrieved November 1, 2011. ^ Ostrower, Jon. "Boeing close to re-engined 737 fan size decision". Air Transport Intelligence news via FlightGlobal.com, August 18, 2011. Retrieved August 20, 2011. ^ "Boeing Launches 737 New Engine Family with Commitments for 496 Airplanes from Five Airlines". Boeing August 30, 2011. ^ "Boeing officially launches re-engined 737". flightglobal.com, August 30, 2011. ^ "Next-Generation 737 Production Winglets". Boeing. ^ "Southwest Appetite for B737-700 Wanes Potentially Affecting Values". Aircraft Value News. June 11, 2018. ^ "U.S. Naval Reserve Gets First Look at Newest Class of Aircraft". DefenseLink (U.S. Department of Defense). Retrieved January 21, 2008. ^ "737-700ER Technical Characteristics". Boeing. ^ "Boeing Delivers First 737-700ER to Launch Customer ANA" (Press release). Boeing. 2007-02-16. ^ James. "Aerospace Notebook: MD-80 era winding down as fuel costs rise". Seattlepi.com, June 24, 2008. Retrieved August 30, 2009. ^ Wilhelm, Steve. "Mindful of rivals, Boeing keeps tinkering with its 737". Orlando Business Journal, August 11, 2008 Retrieved August 30, 2009. ^ "Commercial airlines industry mixed on imminent emission regulations". CNN,June 4, 2015. ^ "End of Line B737-800 Values Show Fatigue". Aircraft Value News. September 17, 2018. ^ a b "Two Early Build B737-900ERs Sold Between Lessors". Aircraft Value News. October 29, 2018. ^ "Latest Register and Monthly Changes". www.iaa.ie. Irish Aviation Authority. 2 Jan 2018. Retrieved 8 Jan 2018. ^ "Boeing launches 737-800BCF programme". Flightglobal. 24 February 2016. ^ "Boeing delivers first 737-800BCF to West Atlantic". Flightglobal. 2018-04-20. ^ a b "GECAS, Boeing Announce Agreement for 35x 737-800 Boeing Converted Freighters" (Press release). 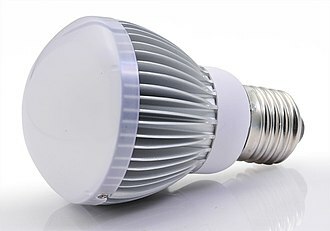 GE. 2018-07-17. ^ "737-800BCF Boeing Converted Freighter" (PDF). Boeing. 2016. ^ "FAA Type Certificate Data Sheet" (PDF). 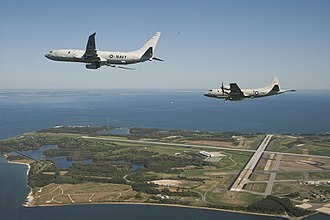 ^ "P-8A Multi-mission Maritime Aircraft (MMA) fact file". US Navy, February 17, 2009. ^ "FARNBOROUGH 2008: Boeing 737 embarks on its Poseidon adventure". Flight International, July 15, 2008. ^ a b "The Boeing 737-700/800 BBJ/BBJ2". airliners.net, February 3, 2008. Retrieved August 30, 2009. ^ "Boeing: Boeing Business Jets". www.boeing.com. ^ "World Airline Census 2018". Flightglobal.com. Retrieved 2018-08-21. ^ "Accident statistics for Boeing 737-600". aviation-safety.net. Retrieved May 22, 2010. ^ "Accident statistics for Boeing 737-700". aviation-safety.net. Retrieved May 22, 2010. ^ "Accident statistics for Boeing 737-800". aviation-safety.net. Retrieved May 22, 2010. ^ "Accident statistics for Boeing 737-900". aviation-safety.net Retrieved May 22, 2010. ^ "Statistical Summary of Commercial Jet Airplane Accidents – Accident Rates by Airplane Type" (PDF). www.boeing.com. Boeing. August 2014. p. 19. ^ "Boeing 737 Airplane Characteristics for Airport Planning" (PDF). Boeing Commercial Airplanes. September 2013. ^ a b "Type Certificate Data Sheet" (PDF). FAA. June 3, 2016. ^ a b "Civil jet aircraft design". Elsevier. 2001. Aircraft Data File - Boeing Aircraft. ^ a b "Next-Generation 737 Family Backgrounder" (PDF). Boeing. February 2015. ^ "Boeing revises "obsolete" performance assumptions". Flight Global. 3 August 2015. ^ a b "CFM56-7B" (PDF). Safran/Snecma. March 2011. ^ "DOC 8643 – Aircraft Type Designators". ICAO. Chris Brady (12 September 2016). The Boeing 737 Technical Guide. ISBN 978-1447532736. The Boeing 787 Dreamliner is an American long-haul, mid-size widebody, twin-engine jet airliner made by Boeing Commercial Airplanes. Its variants seat 242 to 335 passengers in typical three-class seating configurations and it is Boeings most fuel-efficient airliner and is a pioneering airliner with the use of composite materials as the primary material in the construction of its airframe. The 787 was designed to be 20% more fuel efficient than the Boeing 767, the 787 Dreamliners distinguishing features include mostly electrical flight systems, raked wingtips, and noise-reducing chevrons on its engine nacelles. It shares a type rating with the larger Boeing 777 to allow qualified pilots to operate both models. The aircrafts initial designation was the 7E7, prior to its renaming in January 2005, the first 787 was unveiled in a roll-out ceremony on July 8,2007 at Boeings Everett factory. Development and production of the 787 has involved a collaboration with numerous suppliers worldwide. 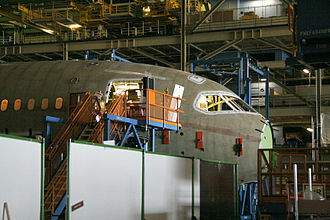 Final assembly takes place at the Boeing Everett Factory in Everett, originally planned to enter service in May 2008, the project experienced multiple delays. 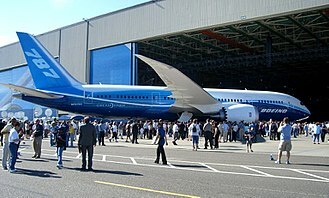 The airliners maiden flight took place on December 15,2009, Boeing has reportedly spent $32 billion on the 787 program. Final US Federal Aviation Administration and European Aviation Safety Agency type certification was received in August 2011 and it entered commercial service on October 26,2011 with launch customer All Nippon Airways. The stretched 787-9 variant, which is 20 feet longer and can fly 450 nautical miles farther than the -8, first flew in September 2013. Deliveries of the 787-9 began in July 2014, it entered service on August 7,2014 with All Nippon Airways. As of February 2017, the 787 had orders for 1,207 aircraft from 64 customers, the aircraft has suffered from several in-service problems, including fires on board related to its lithium-ion batteries. These systems were reviewed by both the FAA and the Japan Civil Aviation Bureau, the FAA issued a directive in January 2013 that grounded all 787s in the US and other civil aviation authorities followed suit. 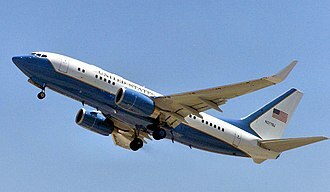 After Boeing completed tests on a revised design, the FAA approved the revised design and lifted the grounding in April 2013. An aircraft lavatory is a small room on an aircraft with a toilet and sink. 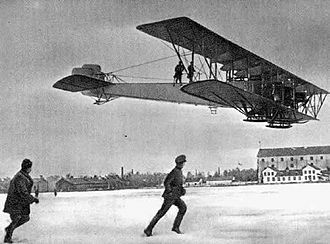 An early aircraft fitted with a toilet was the 1921 Caproni Ca.60, However, it crashed on its second flight, the Handley Page H. P.42 airliner, designed in 1928, was fitted with toilets near the center of the aircraft. The British Supermarine Stranraer flying boat, which first flew in 1934, was fitted with a toilet that was open to the air, when the lid was lifted in flight, airflow produced a whistling noise that led to the aircraft being nicknamed the Whistling Shithouse. The Short Sunderland flying boat, which saw service from 1938 to 1967, was comparatively well equipped. These often overflowed and were difficult to use, the intense cold of high altitude required crews to wear many layers of heavy clothing, and the pilot might have to take violent evasive action with little warning. They were unpopular with crews, who would avoid using them if at all possible. Bomber crew members sometimes preferred to urinate into bottles or defecate into cardboard boxes, during World War II, smaller aircraft such as fighters were fitted with devices known as relief tubes. These consisted of an attached to a hose that led to the outside. These devices were awkward to use and could become frozen and blocked in the cold of high altitude. Such devices are sometimes fitted to modern military aircraft and small. 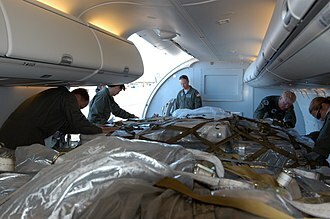 Male glider pilots undertaking extended soaring flights may wear an external catheter that either drains into a bag or is connected to tubing that dumps the urine to the outside. Lavatories per passenger provided aboard aircraft vary considerably from airline to airline, However, in premium cabin and business cabins, passengers may have access to multiple lavatories reserved primarily for their use. These ratios of lavatories to passengers vary considerably, depending upon which airline is being used with some first class passengers having one lavatory for every 12 passengers. 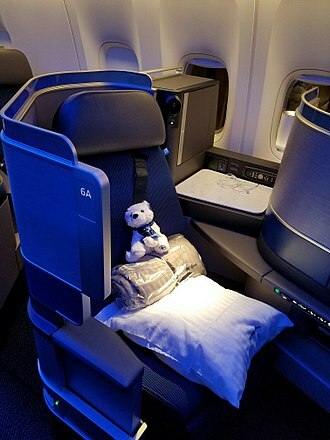 Additionally, many of the larger long-haul airlines elect to equip their aircraft with larger lavatories for this group of passengers willing to pay higher fares. Smaller commuter aircraft and regional aircraft designed for short-haul flights may not be equipped with lavatories, to facilitate sanitation, disinfectant hand-wipes are provided. A business jet, private jet, or bizjet, or simply B. J. is a jet aircraft designed for transporting small groups of people. Business jets may be adapted for other roles, such as the evacuation of casualties or express parcel deliveries, the Lockheed JetStar, seating ten passengers and two crew, first flew on 4 September 1957. The smaller,17,760 pounds MTOW North American Sabreliner first flew on 16 September 1958, powered by two Pratt & Whitney JT12 turbojet engines Garrett TFE731, more than 800 were produced from 1959 to 1982. 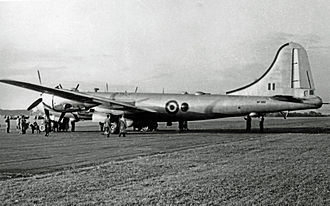 The 25,000 pounds MTOW British Aerospace 125 first flew on 13 August 1962 and its engine were replaced by Garrett TFE731, Pratt & Whitney Canada PW300 turbofans. Almost 1,700 aircraft were produced between 1962 and 2013 after being marketed as the Hawker 800, the 23,500 pounds MTOW IAI Westwind, developed by Aero Commander, first flew on 27 January 1963, powered by two General Electric CJ610 turbojets, Garrett TFE731. 442 were built from 1965 to 1987 and it was developed in the IAI Astra, the 29,000 pounds MOTW Dassault Falcon 20 first flew on 4 May 1963, powered by two General Electric CF700, Garrett ATF3 turbofans and Garrett TFE731. From 1963 to 1988,508 were built and it is the basis of the Dassault Falcon family, the first light jet first flew on 7 October 1963, the Learjet 23. Powered by two 2,850 pounds-force General Electric CJ610, its 12,500 pounds MTOW complies with FAR Part 23 regulations,104 were built between 1962 and 1966 and it is the first member of the Learjet Family. On 2 October 1966 the first large business jet first flew, from 1967 to the late 70s,258 were built and it led to the ongoing Gulfstream Aerospace long range family. The 11,850 pounds MTOW Cessna Citation I first flew on 15 September 1969, produced between 1969 and 1985 at 689 samples, it is the first of the Cessna Citation family. The trijet Dassault Falcon 50 made its first flight the 7 November 1976, the 40,000 pounds MTOW airplane is powered by three 3,700 pounds-force TFE731. With the cross-section of the Falcon 20, it is the basis of the larger Falcon 900, on 8 November 1978, the prototype Canadair Challenger took off. The 43, 000–48,000 pounds MTOW craft, usually powered by two 9,200 pounds-force General Electric CF34, the basis of the long range Global Express family, the 1000th Challenger has entered service in 2015. The fuselage is an aircrafts main body section. It holds crew and cargo, the fuselage serves to position control and stabilization surfaces in specific relationships to lifting surfaces, which is required for aircraft stability and maneuverability. This type of structure is still in use in lightweight aircraft using welded steel tube trusses. A box truss fuselage structure can be out of wood—often covered with plywood. Simple box structures may be rounded by the addition of supported lightweight stringers, allowing the fabric covering to form an aerodynamic shape. Geodesic structural elements were used by Barnes Wallis for British Vickers between the wars and into World War II to form the whole of the fuselage, including its aerodynamic shape. In this type of construction multiple flat strip stringers are wound about the formers in opposite spiral directions and this proved to be light and rigid and had the advantage of being made almost entirely of wood. 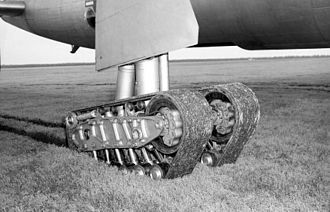 A similar construction using aluminum alloy was used in the Vickers Warwick with less materials than would be required for other structural types, the geodesic structure is redundant and so can survive localized damage without catastrophic failure. A fabric covering over the completed the aerodynamic shell. The logical evolution of this is the creation of fuselages using molded plywood, in this method, the exterior surface of the fuselage is the primary structure. A typical early form of this was built using molded plywood, a form of this structure uses fiberglass cloth impregnated with polyester or epoxy resin, instead of plywood, as the skin. An example of a larger molded plywood aircraft is the de Havilland Mosquito fighter/light bomber of World War II, no plywood-skin fuselage is truly monocoque, since stiffening elements are incorporated into the structure to carry concentrated loads that would otherwise buckle the thin skin. The use of molded fiberglass using negative molds is prevalent in the production of many modern sailplanes. The use of molded composites for fuselage structures is being extended to large aircraft such as the Boeing 787 Dreamliner. This is the method of constructing an all-aluminum fuselage. First, a series of frames in the shape of the cross sections are held in position on a rigid fixture. Delta Air Lines, Inc. is a major American airline, with its headquarters and largest hub at Hartsfield–Jackson Atlanta International Airport in Atlanta, Georgia. 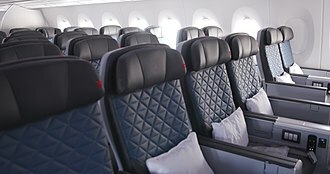 Regional service is operated under the brand name Delta Connection, One of the five remaining legacy carriers, Delta is the sixth-oldest operating airline by foundation date, and the oldest airline still operating in the United States. The companys history can be traced back to Huff Daland Dusters, founded in 1924 in Macon, Georgia as a crop dusting operation. The company moved to Monroe and was renamed Delta Air Services, in reference to the nearby Mississippi Delta region, among predecessors of todays Delta Air Lines, Western Airlines and Northwest Airlines began flying passengers in 1926 and 1927, respectively. In 2013, Delta Air Lines was the worlds largest airline in terms of scheduled passengers carried, Delta Air Lines began as a crop dusting operation called Huff Daland Dusters, Incorporated. The company was founded on May 30,1924 in Macon and they flew a Huff-Daland Duster, the first true crop duster, designed to combat the boll weevil infestation of cotton crops. 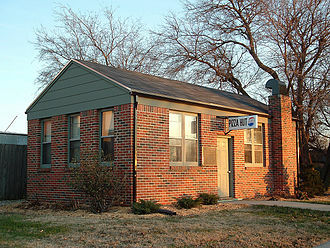 Collett E. Woolman, one of the directors, purchased the company on September 13,1928. 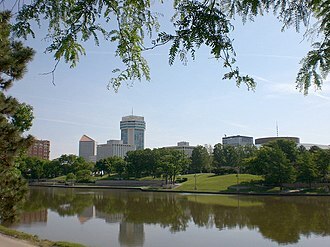 Service began on June 17,1929 with the flight between Dallas and Jackson, Mississippi. Delta moved its headquarters to its current location in Atlanta in 1941, and continued to grow through the addition of routes and they replaced propeller planes with jets in the 1960s and entered international competition to Europe in the 1970s and across the Pacific in the 1980s. Deltas more recent history is marked by its emergence from bankruptcy on April 25,2007, the merger was announced April 14,2008, and was set to create the worlds largest airline. After approval of the merger on October 29,2008, Northwest continued to operate as an owned subsidiary of Delta until December 31,2009 when both carriers operating certificates were merged. 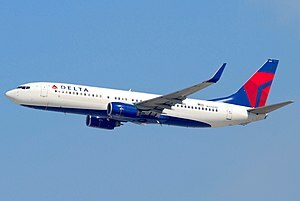 Delta completed the integration with Northwest on January 31,2010 when their reservation systems and websites were combined, Delta Air Lines as it exists today is the result of numerous mergers over its history. The Boeing 737 MAX is an American narrow-body jetliner series being developed by Boeing Commercial Airplanes as the successor to the Boeing 737 Next Generation series. As of December 31,2016, Boeing has 3,605 firm orders for the 737 MAX series, the 737 MAX8 first flew on January 29,2016, nearly 49 years after the maiden flight of the 737 on April 9,1967. The 737 MAX8 gained FAA certification on March 9,2017, first delivery is scheduled in May 2017 to Southwest Airlines, which expects to debut it in October, after Malindo Air during the second quarter. In 2006, Boeing started considering the replacement of the 737 with a design that could follow the Boeing 787 Dreamliner. In November 2014, it was reported that Boeing intended to replace the 737 by 2030 with a new design, possibly with a composite airframe, in 2010, Boeings competitor, launched the Airbus A320neo with new engines to improve fuel burn and operating efficiency. 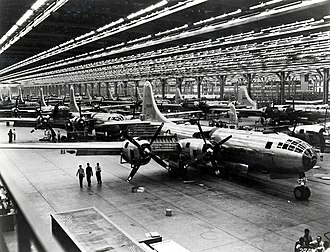 The decision was met with positive reaction by many airlines and they began ordering large numbers of the aircraft, pressure from airlines for more fuel efficient aircraft forced Boeing to shelve plans for developing a replacement aircraft, the Boeing Y1, and instead focus on upgrading the 737. On August 30,2011, the board of directors approved the 737 MAX project. Boeing predicts that the 737 MAX will provide a 16% lower fuel burn than the current Airbus A320, Boeing expects the 737 MAX to meet or exceed the range of the Airbus A320neo. Studies for additional drag reduction were being performed as of 2011, including revised tail cone, natural laminar flow nacelle, in December 2013, Boeing stated that a recent internal audit forecasts a 14% lower fuel burn than current 737NG series aircraft. After having increased 737 production to 42 per month in 2014, Spirit Aerosystems manufactures the 737 MAXs thrust reversers. A shortage of a component for the thrust reverser has developed. 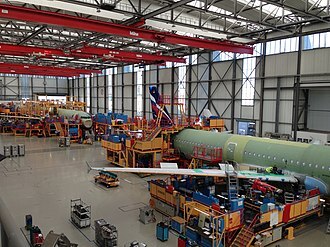 While early test components met Boeings specifications, GKN is unable to ramp up production, the first 737 MAX fuselage completed assembly at Spirit Aerosystems in Wichita, Kansas, on August 13,2015. It will be a test aircraft and eventually be delivered to launch customer Southwest Airlines, on December 8,2015, the first 737 MAX was rolled out at Boeings Renton, factory, this 737 MAX8 is named Spirit of Renton. Boeing Commercial Airplanes is a division of The Boeing Company. It designs, assembles and sells jet airliners and business jets, it provides product-related maintenance and training to customers worldwide. It operates from headquarters in Renton, with more than a dozen engineering, manufacturing. BCA includes the assets of the Douglas Aircraft division of the former McDonnell Douglas Corporation, Boeing Canada Boeing Training & Flight Services CDG Jeppesen, formerly Jeppesen Sanderson. Kevin G. McAllister was named President and CEO of Boeing Commercial Airplanes, McAllister is 53 years old and is a former executive at GE Aviation. For all models sold beginning with the Boeing 707 in 1957, all model designations from 707 through 787 have been assigned, leaving 797 as the only 7X7 model name not assigned to a product. Unlike other models, the 787 uses a single digit to designate the series and this convention was followed in the development of the newest version of the 747, the 747-8. The 747 is the model to use both the triple and single-digit designations. Passenger aircraft that are manufactured as passenger aircraft and converted to freighter configuration by Boeing carry the suffix BCF designating a Boeing converted freighter. The table below lists only airliners from the jet era, the Boeing 707-138B was a shortened-fuselage, long-range model only sold to Qantas. The Boeing 757-200M was a model built for Royal Nepal Airlines. This plane could be converted between passenger and freighter configuration and it was launched by Royal Nepal Airlines in 1986 and delivered two years later. Boeing 747 The Shuttle Carrier Aircraft The Boeing 747 Large Cargo Freighter is a cargo aircraft. The 747SP production resumed nearly four years after the supposedly final 747SP was built and it had a cockpit crew of two instead of the three-crew layout of other 747SPs. Two Boeing VC-25s were built for the US Air Force as Presidential Air Force One transports and this model was a highly modified 747-200B. Boeing was a consultant to Sukhoi on the Russian Regional Jet program that became the Sukhoi Superjet 100 twin-engine narrowbody airliner. The flight test phase can range from the test of a single new system for an existing vehicle to the complete development and certification of a new aircraft, launch vehicle, or reusable spacecraft. Therefore, the duration of a flight test program can vary from a few weeks to many years. There are typically two categories of flight test programs – commercial and military, commercial flight testing is conducted to certify that the aircraft meets all applicable safety and performance requirements of the government certifying agency. Since commercial aircraft development is funded by the aircraft manufacturer and/or private investors. These civil agencies are concerned with the safety and that the pilot’s flight manual accurately reports the aircraft’s performance. The market will determine the suitability to operators. Normally, the certification agency does not get involved in flight testing until the manufacturer has found. Military programs differ from commercial in that the government contracts with the manufacturer to design. These performance requirements are documented to the manufacturer in the aircraft specification, in this case, the government is the customer and has a direct stake in the aircraft’s ability to perform the mission. 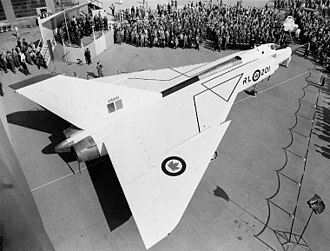 Since the government is funding the program, it is involved in the aircraft design. Often military test pilots and engineers are integrated as part of the flight test team. The final phase of the aircraft flight test is the Operational Test. OT is conducted by a government-only test team with the dictate to certify that the aircraft is suitable, Flight testing of military aircraft is often conducted at military flight test facilities. 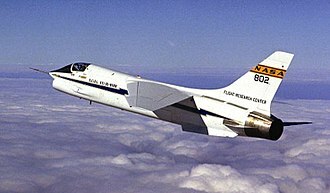 The US Navy tests aircraft at Naval Air Station Patuxent River, the U. S. Air Force Test Pilot School and the U. S. Naval Test Pilot School are the programs designed to teach military test personnel. In the UK, most military flight testing is conducted by three organizations, the RAF, BAE Systems and QinetiQ, all launch vehicles, as well as a few reusable spacecraft, must necessarily be designed to deal with aerodynamic flight loads while moving through the atmosphere. 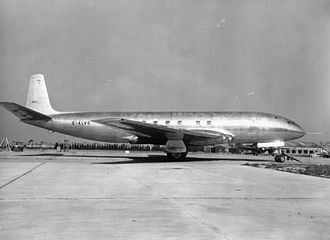 C-40 B/C of the 89th Airlift Wing. 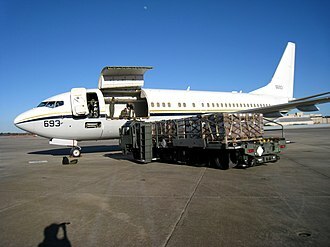 C-40A transporting palletized humanitarian cargo, 2005. CFM56-3 casing, high-pressure compressor revealed. Condor became the first operator of the stretched 757-300 in March 1999. A set of custom made (bespoke) suitcases. The Van's Aircraft RV-7 of semi-monocoque construction. Inside view of the wooden, fabric-covered fuselage of a Fisher FP-202. Control screen fixed to an economy class airline seat (Thai Airways International Airbus A340); the tray is stowed. The Boeing 737-700 airplane used in Gol's second commercial flight, showing the company's brand.